I found My Little House Sewing Book through my library. 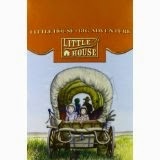 It's a great choice for fans of Little House who want to sew like Laura. 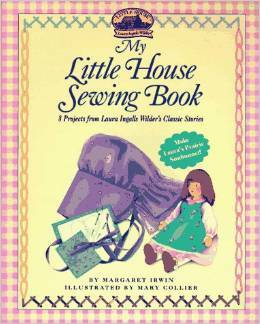 Each of the sewing projects in Sewing Book are designed for a child to sew by hand and were chosen from the Little House books themselves. Margaret Irwin selected eight projects and the book begins with the easiest, a needle book. The most complicated sewing project is the prairie sunbonnet. After the introduction, Margaret Irwin discusses sewing supplies and sewing skills needed to complete the sewing projects. Sewing skills includes marking fabric, pinning, and ending knots, to name just a few. Basic sewing tools are required, and each project is hand-sewn. Children and adults need not worry about experience because all projects can be completed with beginning sewing skills. Inside of the back cover is a special pocket which holds the patterns needed to complete the projects. I would expect a twelve year old with some sewing experience would be able to complete these projects with minimal help from an adult. A younger child would need much more help. Even tracing patterns can be tricky and practice always helps. Though I have not completed any projects from My Little House Sewing Book yet, I have read through the instructions. The illustrations are very helpful and the directions straightforward enough that I do recommend this book. A crafty Little House fan would enjoy this book. 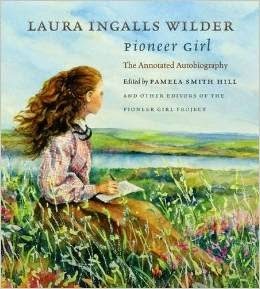 I think it would be best if someone gifted the book with the intention of working through it with a child instead of expecting the child to complete it by herself. I definitely recommend this book though I have not sewn a project from this book. This post contains affiliate links. If you make any purchases through the Amazon links, I will earn a tiny percentage at no additional cost to you. Thanks for your support. © 2014-2018 Annette Whipple. Simple theme. Powered by Blogger.